At Treasure Box Parties we respect our customer’s personal data. Under the GDPR regulations we are now required to clarify what data we hold and how we protect and use that data. We hold no personal customer data on our web server. Form data is transmitted directly from your browser to our email inbox. Personal data that we use in our office is encrypted, and accessed on password protected workstations. Regarding the sharing of our customer’s personal data, we will only share data with our selected partners for the express purpose of delivering services that you are either booking or have booked. We retain these details to better serve you in the future. We will never sell your data. We will not provide your details to any third party that is not involved in the provision of services that you are enquiring about booking, or have booked. We recognise your right to access data we hold about you. If you wish to view this data please email info@treasureboxparties.co.uk and we will provide you with copies of data within thirty days. We recognise your right to be forgotten and if you would like your data expunged from our systems please email info@treasureboxparties.co.uk and we will comply with your request within thirty days. In line with GDPR we have a nominated officer for this process who will record this process and will be your direct contact, responsible for compliance. In summary, we do not use unsolicited email or telephone marketing. We protect your data and do not share it with third parties other than for the provision or endeavour of provision of services. In accordance with GDPR we make the assertion that in engaging in communication with Treasure Box Parties that you understand our data policies and agree to our continued retention of your data and use of your data as described. Should you have any questions please contact us at info@treasureboxparties.co.uk. 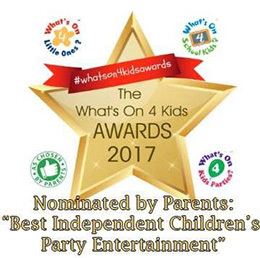 Nominated by parents “Best Children’s entertainment 2013, 2014, 2015, 2016 and 2017″!